You’ve probably heard about Google developing driverless cars, so it’s only natural to imagine that the unpleasant experience of parking might eventually become driverless as well. Well, it seems the future has arrived, in Germany, at least. 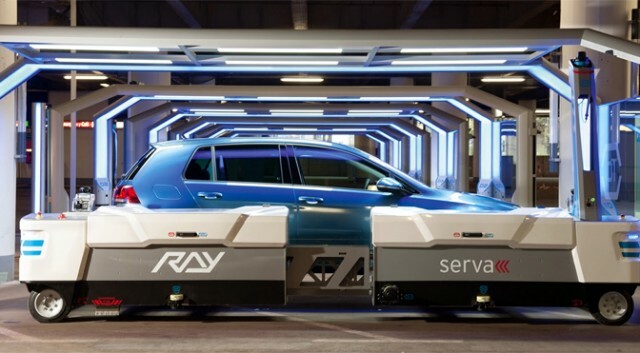 German company Serva Transport Systems has just debuted a revolutionary robotic parking system, which uses a self-driving forklift to smoothly and elegantly park cars at the Dusseldorf Airport in Germany. While we’ve seen other automated car parking systems, involving forklifts, moving platforms and other methods, this particular system, nicknamed Ray, really takes forklift design and efficiency to a whole new level. According to Ray’s designers, the system can park up to 60% more cars in the same parking area that would otherwise be inefficiently used by drivers and valets in a chaotic parking lot. As the number of cars on the road increases along with the cost and space required to park them, self-driving forklift parking systems like Ray will be extremely valuable in the years to come. Watching Ray in action is pretty remarkable, and incredibly seamless for the customer who simply parks their car in Ray’s area, pays and walks away. Ray will then perform a 3-D scan of the car, then adjust its tines and tires to smoothly and accurately slide beneath the vehicle and lift it by the tires, avoiding potential harm to the frame and paint. The car is then moved to an available space, where it awaits the return of its driver and then is retrieved by Ray. There are, of course, limitations and drawbacks to Ray, including the current cost of the system and the price for the user ($40 to park). Ray is also currently unable to lift a vehicle high enough to utilize tiered parking structures, which other forklift systems can use to maximize storage space. Prices will likely drop overtime as demand increases and the technology should quickly improve to allow for tiered parking. Keeping an eye on the development of Ray and other self-driving forklifts is not only compelling as a driver, but as a forklift operator there are sure to be many technological developments that will spring from the system that will effect how driver operated forklifts function in the years to come that will be useful for certified forklift operators to know. What are your thoughts on this new self-driving forklift?